In the Deep South, the stand placement strategies really don’t change much after the first does come into estrus. Although the comparative lack of breeding intensity may result in funnels receiving a lessened amount of buck travel for a typical day of the rut, they’re often still good choices on the last day of season. The same holds true for catching bucks prowling family group bedding areas and scent checking food sources. All three locations are still good choices for stand sites. 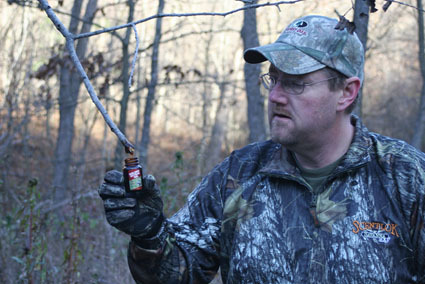 As you will find is the case with the post rut, the best bet of tagging bucks during the second rut lies in shifting our placement strategies to revolve around the hottest food source that the area holds, keying on the areas within the food source that yield the most concentrated feeding activity. Certainly, there are times when the bruiser will still check the family group bedding area, but, unless continued hunting pressure has soured him on daylight visits to the food source, that placement option no longer wins the risk and reward comparison. Simply put, in most settings, the odds of catching him at the food source are better and offer less of a risk of altering the deer’s patterns.